The laser lipo is fantastic for bingo wings – nothing beats it! Here at The Beauty Clinic we don’t just give you one ten minute treatment, we recommend 1 hour and then see the results. The way that the laser works is by sending pulses of laser which break down the membrane of the fat cell, therefore releasing the fatty acids, water and glycerin (which makes up your fat cells). This liquid is released into your lymphatic system which you dispose of via your waste. This is how we reduce bingo wings by placing the paddles around the arm. This reduces fat and tightens the skin. Recommended 1 treatment per week (depending on how much you want to reduce your bingo wings by). At some stage as everybody ages, the inner thigh loses its tightness and produces an unsightly linage. By placing the paddles on the inner thigh we can achieve amazing results by giving you the youthful look once again. Be Party Ready and see results in 60 minutes . Get the figure you have always wanted without putting all that effort into a strenuous workout in the gym. is measured before and after with a reduction of between 1-3 inches . 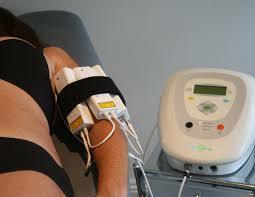 Uses 60 diode laser paddles which are attached to a strap and placed on the required fatty areas. 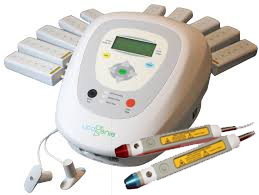 The breaking down of the fat cells starts when the laser penetrates the skin and makes contact with the fat cells. Pores form on the cells causing them to release free fatty acids.